I wasn’t going to say anything, but I feel I need to. Simple Plan has been a mainstay in my life for the past 12 (almost) years. I saw them for the first time in 2005, flew to Brisbane so I could see them. I was living in Townsville at the time and in those days “big” bands didn’t do the North Queensland city. Then I moved to Perth, and the boys were meant to come in 2008. Now, what happened was that they had booked an 18+ gig and they ended up having to cancel as they didn’t get enough bookings for some reason or other. The band apologised and promised they would be back. I personally got upset (and became an A7X fan…) but at the same time I held them to their promise. And guess what, they kept it. Five years later, in 2013 as part of their Warped Tour run, they came back to Perth, because Perth wasn’t getting Warped Tour. Yes, I saw them again in 2012, once again flying over to Melbourne, and that was absolutely amazing, especially as I met them for the very first time. But, the point of my post is this: it disheartens me to see fans of Simple Plan getting angry at Chuck and/or the band for not scheduling shows in their city/country. There is only 365 days in a year…and they can’t get everywhere at once. Also, they need to have breaks so they don’t burn out, and they can also go where there is demand. Chuck (the band) and management try their hardest to plan the best tours and we as fans need to give them a chance. And sometimes it’s out of their control. Consider the fact that there’s only a certain amount of venues in each city, and then the fact that there may be many other artists and bands touring at around the same time…well, they have to fit their schedule between other events. Chuck himself tweeted that they have tried their best and he promises if not this time…there is next time. 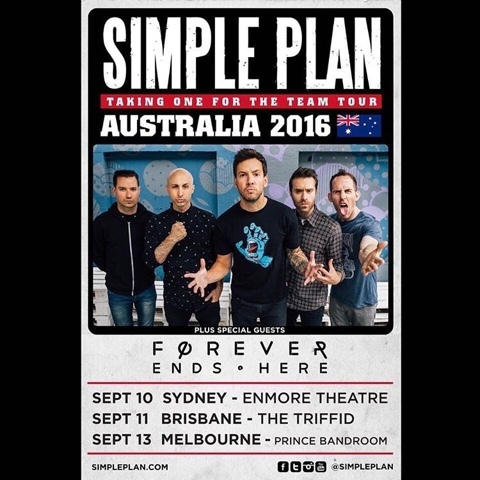 We all know that Simple Plan’s tour cycles often go over two or more years…and they often come back. Take the European Tour as an example. They’ve toured there twice, already. So, in this time period where we are so used to having things instantly…how about we all slow down and remember how to be patient? The guys love us and love performing for us. They’ll come see you. Soon. To all my fellow Aussie fans. If you are lucky enough to get to one of their three shows? Enjoy and cherish it as a special moment in your life. Be it your 1st, or you 100th Simple Plan concert.